Ess: Hello and welcome back to the very fifth issue of Running on Italics, stimhack.com’s flavour review column! Holy hell in a handbasket, we’ve done four of these already, Cee. Cee: Let’s just get to the cards, shall we? Ess: Are you still fretting over missing out on top eight at Sydney regionals? We’ve all been ninth by two points before, dude, it’s nbd! Cee: Well, I hadn’t. My only consolation is that you placed lower, for once. Ess: What can I say, my play just bombed after lunch. But yeah, you’re right, let’s get to the cards. Cee: Oh, Anarchs. Always so obsessed with how they look to others, aren’t they? Someone actually gave their script a render of flaming nonsense runes, just because they want it to “look like magic”. Ess: We’ve canvassed experts in ancient languages about the runes, dear readers, and we can report unanimous agreement that they are, in fact, nonsense. Cee: This would look pretty magical to a sysop though. You spot an intruder go into your trash, and then a piece of ice somewhere else in your network just spontaneously combusts. Ess: Yeah, the effect is really clean. The script needs access to whatever source code you can get, and then you let it loose on that ice over there. We’ve seen cards like Parasite be able to target ice without going through the outer layers of security, so that’s not new. 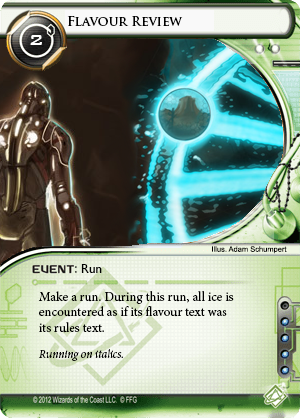 Ess: Can I just say, though, how horrible the flavour text is? It’s completely fine, good even, until the word “magic”… and then it keeps going. Ess: AND GOING. A bit of restraint, folks? Cee: Awkward sentence is awkward. The rest is solid though, so I’m quite happy to give this a B+. Ess: I’ll give it a B-. Cee: The art is cool. But I have no actual idea what’s going on. I mean, I’m guessing that the USB-looking port on her head is the Skulljack… but then why is the focus on her hand and the device? Ess: I guess she’s configuring it? That’s a super cute holographic logo for what may as well be a spike jammed into your brain. Cee: Are the electricity arcs literal? Is she flipping bits with M-x butterfly? Ess: It could just be visual fluff. Arc effects, $299.95. Great for impressing the neighbours! Cee: I mean, you jest, but this does seem to be a bit of a recurring theme for our Anarch friends, no? They exist to be noticed. What’s the point of these exploits if they aren’t big and flashy? Ess: Showing Off. Though I suppose Notoriety is Shaper. Ess: I’d also like to talk about just how bad a card this is. Cee: Ess, we’re a flavour review column. You have seen our custom card at the start of each article, right? Ess: No, this is relevant! The flavour text goes to great lengths to establish the Skulljack as an incredibly common, widely seen cybernetic implant. And I can see why, if it’s a brain machine interface! That sounds like it would make all your work around computing easier. Cee: Oh, I see. Instead of something super useful, it … just makes it slightly easier to turn off a megacorp’s Adonis Campaign? That’s such a specialised requirement that even the majority of runners won’t be using this tech, let alone the general populace. Ess: Yep. One of my favourite things about the game is how good it is at putting you in the head of the runner. (Or the Chief of Security, on the corp side.) The decisions you make, from deckbuilding to installation to running and rezzing, have direct analogues to decisions real people would be making. So, yeah, I think Skulljack totally breaks that identification between the runner and player, because of how bad a card it is. Cee: Mm. Are you okay with a flavour C? Ess: Call it a D. I’m really not happy with this one. Ess: So I’m a big fat megacorp, right? I own lots of people and facilities and assets and whatnots. Some time ago, we built an arcology on Gila Hands, and I’ve been enjoying a steady income from it since. Ess: And then this punk slips into my R&D and finds our plans to build in sleeper programming into our bioroids. Just plans! We haven’t put any real money or time into working on this, mind you, just R&D dev effort! Ess: And then somehow we don’t have the arcology and instead apparently retroactively have that sleeper program ready and deployed into bioroids in the wild. Cee: Wish I could help you out here. This card makes absolutely no sense, as an effect or even a possible thing that could happen in the world of Android. The only thing about this card that has any relevance is that it’s called Turntable and you’re swapping agendas. Cee: At least the art is amazing? I really really like the art. Noise dyed his hair! It matches his faction colour now, which is a little cute. Ess: Sure fine yes. Can we retroactively apologise to Beach Party and give this an F instead? …Yeah. Ugh. F? I’m actually willing to give this thing a flavour F.
Probably fair. And here’s hoping we never have to again. Cee: First Genetics, now Cybernetics. Oh the humanity! Ess: That is, in fact, the point! Humanity+ Augmentation, for when you just must have that body mod. Cee: Are you not a fan of transhumanism, Ess? I thought you’d be all for overcoming our fleshy weaknesses. Ess: Oh, believe you me, augmentation is my jam. But… well, look at the flavour quote; this isn’t going past our human limitations; this is importing new ways to double down on them. These augments live in the Android world, which means they’re gritty and they cost and the good stuff’s never legal. Ess: —of the world here was exactly what I loved about the Genetics suite, yea? I mean, Terminal7 suggested art literally made only for those who can afford to see it, and these ramifications are coming through loud and clear in Chrome City. Cee: If a bit less perfectly on-message, as befits the more industrialised town. Ess: But yeah, it just sorta grinds my gears that the choppers have coopted the… the belief in our better selves that is transhumanism for, well, this. Cee: Well, there is precedent. Tattoos, right? In a world where clones and bioroids are subjugated, there’s still quite a bit of rejection of anything non-human. This is subculture stuff, stuff you flaunt because you’re daring that ristie to make something of it. Cee: I mean, look at the art; the whole shop-front screams seedy (subtypes, FFG!). The door handles are hands, the neon lights are tacky. That dude’s eyes are glowing ominously. Ess: The Shoppe was Shaper, while the Parlor is Anarch. Christ, I just noticed how none of the Genetics were outwardly obvious, either. Cee: So you could read the cybernetics as just another reification of the very human tendency to declare yourself more than what others see you as. I dunno, that’s a kind of humanity I can support. Cee: …I’ve been around you too long. Anyway, I love this card; it’s just on point on all points, art, flavour, and worldbuilding. I’m giving this an A.
Ess: Mmm. And yeah, definitely, totally an A.
Cee: Hi Gabe! That is Gabe, right? Cee: So this is the first time we’ve seen Gabe in casual clothes, I think. Even in Power Tap he’s wearing … a jacket? Ess: He’s undercover, of course. Oaktown feels like a port city, yea?, with a big industrial complex and shipping containers everywhere. Whatever security checkpoint he’s going through expects dockworkers, so today that’s what Gabe is. Cee: I expect titanium ribs would be something of a common augmentation, amongst blue-collar workers. Ess: Oh yes, please do undergo life-threatening invasive surgery so that you’re more likely to get hired. We don’t mandate it of our employees, not at all! But your performance review is coming up, and, well, can you really afford the extra insurance? Cee: So the idea seems to be that the ribs make you more resistant to pain, and so you can selectively hold important thoughts in our head instead of just having a primal reaction. I guess that makes sense. Ess: Yep! Clean and simple card, mechanics and integration. B+? Cee: The art does its job well, too. An A- seems fair. Cee: I mean, you pry open a door, you smash down a wall… you could just smash down the door as well. Ess: I still don’t understand why these get stronger with more breakers installed. It makes even less sense now that there’s more than one of them, because clearly now it’s not some barrier-specific concept. Cee: These breakers really seem to be built from the physical analogies. With Battering Ram, or Corroder, say, you get the sense that someone wrote a program to take down barriers, and then names came from watching the resulting programs in action. There were design, architecture, and algorithmic decisions that led to how differently those breakers operate, and the names naturally arose from those processes. Ess: Yog.0 is the best example of this, I think. Someone named it after Yog-Sothoth, “the key and guardian of the gate”… not because the Cthulhu mythos has anything really to do with how a crowdsourced collection of passwords works, but because he or she had an opportunity to make a silly reference and was doggone well going to take it. It feels organic. Cee: Yep. Whereas Spike, Crowbar, and the upcoming Shiv absolutely do not. There’s no creation story for them that makes sense of their names or shared mechanic, and every attempt to do so ends up being after-the-fact rationalisations. Ess: That’s easily my biggest problem with this suite, yeah. It just feels like someone at FFG hacked these out the day before they were due. We know you can do better, folks! Cee: We can’t really give it anything other than a D.
Ess: Go stand in the corner with your Spiky friend. Ess: Holy crap look at that art. Cee: That glowing, neon eye. That stem being fed into her brain. Ess: That socket. All metallic and dark and empty. Cee: I’m not that much of a fan of how deliberately fuzzy the background is, but it’s still great art. Ess: Her new eye’s just out of focus right now! It’s weird how this card makes me understand the sacrifice involved in cybernetics more than either of the the brain damage cards. It’s probably because vision is such an important sense to us humans; here you directly get to see, no, yeah, you actually have to give up your existing eye first, with no recourse if the surgery doesn’t take or your NRE gets rejected. Cee: It’s just a little existentially terrifying. There are many ways to get enhanced vision, and you chose this one. Ess: This is also a great example of a card which doesn’t need flavour text to let us understand it. Just a great name and great art, and you have a winner. Cee: Well, now that you say that… the mechanics are confusing. Why only one breaker? And if you’re identifying weaknesses with your eye, surely it should be an ice interaction instead? Ess: …yeah, you’re right. The game reason there is “so that it works on Lotus Field”, but I’m not clear on what the actual mechanic is supposed to be. Maybe you’re supposed to be reading the breaker’s source, keeping your understanding of it in digitally-enhanced working memory? Cee: That’s one explanation, but it’s not exactly convincing. Shame, too; the card was doing so well. Cee: It feels cool. It looks cool. It evokes cool. I have no idea why. Someone explain this to me? Ess: The dreamers feel very spiritual to me, and I’m not really sure why. Maybe it’s the reverence with which they’re treating whatever they’ve found. Maybe it’s the quasi-mystical flavour text. Maybe it’s just in the dream of the name. Cee: They’re so incredibly intent on the box, whatever it is. Pandora herself was never so attentive. Ess: The companion cube seems like it’s actually representing hope here, interestingly enough. There’s a fervor there that almost reads to me as religious sect, or at least a widespread spiritual meme à la New Age today. Ess: Analog attire, right? Yeah, these feel like spiritual AIs, to me, who hold as a tenet of faith that physical embodiment is, uh, superior to their digital embodiment. They may or may not literally use the word “soul”, but they certainly dream of being analog. Cee: Do we even know if the Android universe has AIs with that kind of free agency? There are the bioroids, shackled to servitude to Haas, and there are the programs on the runner side the game calls “AIs”, but I’m not sure we’ve seen AIs be anything more than useful tools in this world. Ess: Well, bioroids at least are explicitly human brains that have been “taped”, so I’d assume it’s more that they’ve been mostly lobotomised than that they don’t have free agency. But… yeah, is Crypsis doing contract work for you, or is it just an unusually generalised breaker? Cee: I guess it’s a neat interpretation of everything but the mechanic itself… but then there still is the mechanic itself. So you hand over access rights to your friends, the dreamers, and the next time you look it’s as if the asset was never there? Ess: Yeah, the mechanic is super narrow and has all sorts of weird implications. A card coming out of R&D is meant to be your dev department handing you something ready to be deployed, so I don’t really know what shuffling it back in means. Cee: Something something recalls? But I have no idea how the dreamers are meant to be helping with that. I like our interpretation, and it seems to fit, but the card is still overall very strange. B-, I guess? Ess: I’m gonna be more generous, just because I love the ambiguous space we’re playing in, but it is certainly confusing, yeah. B+. Ess: How does replacing the bones in your skull help your working memory? Cee: And how is that cheaper than installing a jack into your brain? Ess: I could have understood an effect like conditionally replacing brain damage with net damage, but yeah, this just doesn’t make any sense. Cee: Unless the cage is active hardware, I have no idea how it’s supposed to do that half of Box-E’s job. Ess: And what’s going on with the art? I love that the cage is branded, but I’m confused about the situation. That’s an ECG readout on the right, so this is clearly a surgery in progress and there’s a patient around somewhere. But what are those tendons stretched out around it? Cee: Yeah, I’m not super clear on that either. Cee: I know what this is. Cee: That’s the patient’s skin. Skin peeled back from their actual skull, so that the surgeon can access the bones. Christ that is creepy. Ess: …Holy crap that is great. That’s legitimately brilliant, actually. Flesh keeping you from reaching the surgery target? Just peel them away! Ell: Would you care for an expert opinion? Ess: Oh hey, it’s Ell! Hey, everyone, please welcome our medical correspondent, Ell! Ell: I’ve seen a lot of faces peeled off in my time, and I can absolutely tell you that that’s not what that looks like. Muscles attach to the bone in very specific places, and they do not come off in tidy little sheets like that either. Ell: And you definitely couldn’t really remove the eyes in any meaningful way. The optic nerve is so thick and complex you couldn’t really reconnect them once you’ve removed them. Basically, when I look at this art, I can’t help but wonder where all the rest of the flesh and muscles are. Not to mention all the tissue attached to the internal surfaces of the skull, like the lining of the air sinuses. Ess: Yikes. What do you think the art is supposed to be, then? Ell: Oh, it’s definitely supposed to be the patient with their skin peeled off. Have you noticed their hair in the background? Ess: Ahahaha, yes. Well, is there any other plausible way this surgery could be happening? Ell: If you were happy to remove the patient’s skin and fleshy tissue anyway, you could probably do a face transplant once the operation finished. We know cloning technology is highly advanced in the Android universe, so it’s entirely possible they could reattach a new face from your cloned cells. Ell: I do want to emphasise how difficult this still would be, though. The flavour text is underselling it, massively; even with robotic surgeons precise down to the micrometer there would be huge potential for catastrophic error. Along the lines of brain lesions, death, or worse. Ell: There are secrets man was not meant to know. Ess: Thank you very much for your insight! I assume you’re not super fond of the card, then? Ell: Thank you for having me, you two! Ess: Everyone, please give a big hand to our medical correspondent and very first guest star, Ell! What are you rating the card, Cee? Cee: aaaaaaaaaaaaaaaaaaaaaaa— I dunno, I think it works fairly well as a card. I’m happy with a C+, with the sheer implausibility of the card knocking down a few points. Ess: It does seem like a different category of implausible than even the weirdest parts of the game otherwise. C+ sounds fair to me. Cee: Chrome City, huh. Yeah, I’m feeling it. The art game is so very strong in this pack, gorgeous even; I really love everything going on so far. Ess: Yeah. Though, this is the pack that’s least had the sense of place we’ve been talking about in the Sansan cycle so far. It’s to its benefit, I think; cards like Analog Dreamers are stronger for not having to tie into Oaktown except thematically. Cee: It does leave us with less of an idea onto the city itself, though. I dunno, this is a fine line to walk, and I’m not sure we have enough on Chrome City. Ess: Well, don’t say that yet, we still have the corp half to do! Which we’re going to be delayed in; sorry folks, but it’s going to have to happen. Believe me, I’m just as annoyed as you that cyberlegs mean a week’s worth of coma. Cee: Just try to avoid any self-destruct chips, dude. Chrome City, flavour review, Fluff and Flavor, Running on Italics.